What’s the first thing you think of when planning to look for a new cloud based training provider? Let me guess – you don’t know. But don’t let it worry you, you’re in good company. Everyone’s in search of the best cloud training provide for them nowadays. After all, cloud technology offers the training industry so many new horizons for effective learning, efficient management, and much better pricing. But the market is swamped with hundreds of providers, and they all promise you the moon and the stars. The tough search gets even tougher when there are so many important factors to consider. 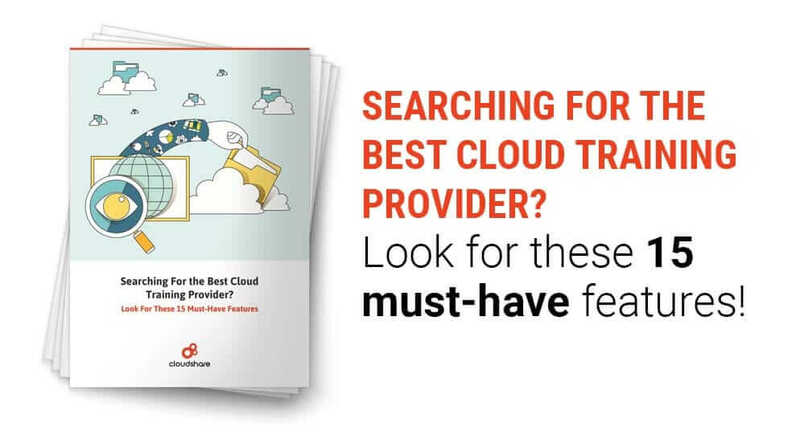 But worry no more – in this passage, we will try and make things much simpler for those in search of the perfect cloud training provider, with a two-stage selection process. When starting out this frightening process, take a big breath, and divide it into two stages: the first should be more general, and relate to the basic benefits every top cloud provider must have. The second stage should be at a higher level of selection, relating to the actual features the best cloud based training provider should offer. These 3 criteria are the first filter to any classification process. A detailed account of these can be found here. And yes, it’s worth the read; you won’t get much further without this critical filtration stage. Now that we have that covered, we still remain with a few prominent providers to choose from, mainly: CloudShare, Skytap, Hatsize, Readytech, Amazon We Service and Azure. This time sorting out the various providers is a matter of deeper examination of what they offer in terms of actual features, and how those features support the best possible virtual training experience. The best hosted lab environment should empower training managers to take their on-site training environments and bring them to the cloud, in less than a minute. Leveraging an easy-to-use, self-service platform, training managers should get immediate access to virtual infrastructure resources, including virtualized hardware, servers, networking, storage and pre-installed operating systems, and application licenses. This allows instructors to instantly create, provision, replicate and share their training environments with students. Download this detailed account of the 15 most important features a hosted lab environment should include and find your best cloud based training provider!